William Orland Kilmer was born on September 5th, 1939 and grew up just outside of Los Angeles. Attending football games at the Los Angeles Coliseum as a boy, Kilmer knew he wanted to be an athlete at an early age. Ironically, Billy Kilmer never saw himself going anywhere as a football player. Baseball and basketball were his true sporting loves growing up. A .525 hitter and rated one of the top 30 basketball players in the nation during his senior year at Citrus Union High School in Los Angeles, Kilmer appeared headed for greatness on the diamond or basketball court, not the gridiron. He was so gifted as a baseball player, Billy was offered a $50,000 contract to play for the Pittsburgh Pirates upon graduating high school. But his mother was determined he go to college, so when he was approached by one of UCLA�s assistant coaches about playing for football great Red Saunders, it was an opportunity Kilmer couldn�t turn down. Even at UCLA, the dream of becoming a baseball or basketball star persisted. Billy walked on to the legendary John Wooden�s UCLA basketball team his junior year, playing the entire season on an injured ankle. But it would be as a football player that Billy would truly shine. At UCLA, Kilmer demonstrated true athleticism, smarts, and versatility as a single-wing tailback. Turning in gritty, opportunistic performances became routine for Kilmer from 1958 to 1960, as he played on a series of bad UCLA teams. In 1960, he led the Bruins in rushing, passing, scoring, punting, and total offensive yards (1,889 yards), and was named UCLA�s most valuable player. That same year, Kilmer was named an All-American, played in the College All-Star game (where he was named MVP), and finished 5th in the Heisman Trophy voting, a remarkable achievement for a man with �no talent�. In 1961, any illusions about Kilmer�s sports future evaporated when the San Francisco 49ers selected the 6� 4�, 220 lb. Kilmer with the 11th pick in the first round of the NFL draft. Kilmer was also drafted by the American Football League�s Los Angeles Chargers. The Washington Redskins could have drafted Kilmer that year, but instead picked up Wake Forest quarterback phenom Norm Snead, while future greats Mike Ditka, Fran Tarkenton, Deacon Jones, and Bob Lilly were also drafted that year. Kilmer signed with the 49ers for $15,000 a year and a $6,000 bonus. During his early years with the 49ers, Kilmer mostly rode the pine behind veteran quarterback John Brodie. Still, over the course of the 1961-1962 seasons, the shifty converted tailback contributed. Throwing a total of just 27 passes (including a single touchdown pass) over 23 games, he scooted for nearly 1,000 yards on the ground and scored 15 rushing touchdowns operating out of the 49ers new �shotgun� formation. He was so successful on the ground, the 49ers had plans to use Kilmer as a running back. But in 1963, Kilmer�s career came to a crashing halt when a serious auto accident nearly cost him his leg, and sidelined him for the entire season. Confounding doctors, several of whom recommended his leg be amputated, Kilmer not only made a full recovery, but returned to the 49ers in 1964. Backing up the reliable Brodie until 1967, Kilmer was replaced on the 49er�s bench by Steve Spurrier, and was dealt to the fledgling New Orleans Saints in that year�s expansion draft. Arriving in New Orleans, Kilmer was coached by former UCLA coach Tom Fears. Surprising everyone, he beat out the more highly-regarded Gary Cuozzo for the starting quarterback job, and began learning how to beat teams with his arm and head, and not just with his feet. In each successive season with the hapless Saints, Kilmer threw more accurately and for more yards. In 1969, he managed a respectable 53.6% completion rating, throwing for a healthy 2,532 yards and 20 touchdowns. Quarterback Billy Kilmer had finally arrived. But in 1971, when the Saints selected a young Mississippi quarterback named Archie Manning with the 2nd pick of the NFL draft, Mr. Kilmer knew his time in New Orleans was over. Kilmer had heard rumors that then Rams coach George Allen �really liked him,� and that the coach spoke often about the quarterback�s grittiness, toughness, and smarts. But Kilmer held out little chance of going to the Rams, since Roman Gabriel was their entrenched starter. After leaving the Rams, George Allen was named the new head coach of the Washington Redskins, and immediately made Billy Kilmer his first player acquisition. Kilmer was not enthused and, at his first sit-down with Allen, actually asked to be traded. The Redskins had a bonafide star in Sonny Jurgensen, and Kilmer saw little chance of unseating one of the best pure passers in the game. But like the current Redskin�s coach, Allen believed you could never have too many good quarterbacks. The spunky and positive Allen quickly convinced Kilmer something special was going to happen in Washington and Kilmer would be a big part of it. Kilmer was a George Allen �kind of guy,� and when Jurgensen suffered a shoulder injury in the 1971 exhibition season, Kilmer was handed the starter�s reins. During the 1971 season, Kilmer played remarkably well, mixing passes to Roy Jefferson and Charley Taylor in with hand-offs to backs Larry Brown and Bob Brunet. Allen believed in a conservative offense that put his tenacious defense in a position to win games, and Billy Kilmer was perfectly suited for that role. In 1971, he threw for 2,221 yards, completed 54.2% of his passes for 13 touchdowns, and led the Redskins to a 9-4-1 record and their first playoff berth in 26 years. The Skins went down to defeat against the 49ers in the playoffs (in a game where it�s reputed Allen used a reverse drawn up by then President Richard Nixon�with disastrous results), but it was a great start and earned George Allen �Coach of the Year� honors. Sonny Jurgensen and Billy Kilmer were kindred spirits from the start. Although they couldn�t be less alike in their skills and style of quarterbacking play, they became quick friends. Jurgensen (�Hobble� as the local media nicknamed him) was the prototypical pure passer; tight spirals a thing of beauty, not averse to risk-taking, and spontaneous on-the-field decisions or improvisation�a habit that frequently brought admonishment from Allen. Kilmer (�Wobble� as he was sometimes called) was the blue-collar guy, who inexplicably seemed to get the job done, followed the game plan to the letter, but also threw one of the ugliest passes in U.S. quarterbacking history. According to legend, the lifelong friendship between the two competing Redskin quarterbacks began with a simple question from new arrival Kilmer, �where can a guy get a beer around here?� Kilmer and Jurgensen became inseparable friends both on and off the field. When Kilmer, clearly Allen�s favorite, struggled, in came Jurgensen. If Jurgensen had a bad game, or was injured, in came Kilmer. While Jurgensen and Kilmer were at ease with one another, rabid Washington D.C. Redskin�s fans had another view entirely, as �I Love Sonny!� and �I Love Billy!� bumper stickers competed for space on vehicles all over the metro area. Kilmer and Jurgensen�s love of D.C.�s nightlife was legendary. According to David Elfin of the Washington Times, on the way home from one of their favorite watering holes, Kilmer and Jurgensen came up behind a car with an �I Love Sonny!� sticker on the bumper. Pulling alongside the shocked driver, Kilmer laid on the horn and �flipped the guy the bird�. A few miles down the road, Jurgensen returned the favor when, seeing a car with an �I Love Billy!� sticker, he screamed for the driver to take it off, almost forcing the driver off the road. Clearly, while Redskin�s fans may have smelled a quarterback controversy, it was all in good fun for Kilmer and Jurgensen. And the Redskins flourished with the arrangement. In 1972, George Allen�s �Over the Hill Gang� and the combination of Kilmer/Jurgensen spurred the Washington Redskins to an 11-3 regular season record. After Sonny Jurgensen tore his achilles tendon midway through the season, the fate of the Redskins lay squarely on Kilmer�s shoulders. They beat the Green Bay Packers in their first playoff game, and triumphed over the dreaded Dallas Cowboys in the 1972 NFC Championship game, 26-3. Kilmer attributes perhaps his best performance ever in the championship to comments made by Dallas head coach Tom Landry just before the game. Landry predicted the Cowboys would win the game because �Roger Staubach is the better athlete.� The comment made Kilmer furious, and he set out determined to show Landry and anyone else watching there was more to being an athlete and winner than throwing a tight spiral. Under the guidance of offensive coordinator Ted Marchibroda, he completed 14 of 18 passes for 198 yards including two perfect touchdown passes to Charley Taylor, while the rattled Staubach was only able to complete 9 passes. On a positive note, while running for his life, Staubach earned leading rusher honors for the Cowboys that memorable day! After the game, several Redskins were overheard saying perhaps Landry should�ve started Craig Morton, since he was the �better athlete.� The Redskins eventually fell to the Bob Griese-led Miami Dolphins in Super Bowl VII that year, crowning the Dolphin�s undefeated season. Kilmer, along with fellow Redskins Len Hauss, Larry Brown, Speedy Duncan, Chris Hanburger, and Charley Taylor were named to the 1972 Pro Bowl. Despite the disappointment of a sub-par Super Bowl performance, there was no question that Allen and Kilmer had brought the Redskins back. The Redskins continued to be a potent combination of effective offense and stifling defense in 1973, en route to a 10-4 record and their 3rd straight playoff appearance. In the season finale against the Eagles, Kilmer, who had been hospitalized the week before with an intestinal blockage, walked out of the hospital to throw 4 touchdown passes. The Redskins fell that year in the first round of the playoffs to a talented Minnesota Vikings squad led by Fran Tarkenton, although Kilmer twice brought the Redskins back to nearly win before throwing a game-ending interception. In 1974, the Redskins were again a playoff team in a toughly-contended NFC East, where their 10-4 record was only good enough for second place. Jurgensen and Kilmer split time that year, both contributing heavily to the Redskin�s success. But the Skins season ended against Allen�s old team, the Rams, in the first round of the playoffs as the weight of 6 turnovers was too much for the Redskins to overcome. 1974 marked the end of the line for Sonny Jurgensen, and the rest of Kilmer�s career was to be marked by his efforts to retain his starting job against the challenges of advancing age, nagging injuries, and the ever-present threat of a talented but pesky Joe Theismann. The friendship between Kilmer and Jurgensen was already strong prior to the 1974 arrival of brash, ****y, talkative, and ambitious former Canadian Football League star. After leading the team to a pre-season win his first year, Theismann was asked by a reporter what he�d do when the other two quarterbacks returned. His reply, that he would �keep the two old men on the bench,� would irk Kilmer and Jurgensen for years. 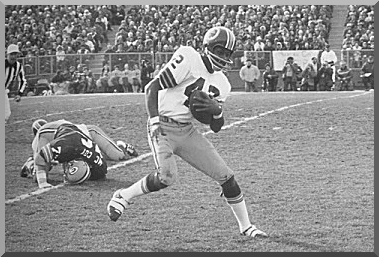 1975 was a transition year for the Redskins, as the �Over the Hill Gang� began to truly look over the hill, and the Skins struggled their way to an 8-6 record and a 3rd place finish in the NFC East. Kilmer played well, throwing for 2,440 yards, completing 51.4% of his passes, 23 for touchdowns, and had one of the best games of his career, a home win against Dallas. Trailing 14-3, Kilmer brought the Skins back throwing for 3 touchdowns, the last to force overtime. In overtime, following a Staubach interception by Ken Houston (and the infamous personal foul on Staubach for throwing a punch at Pat Fisher), Kilmer led his team down the field, quarterback-sneaking his way across the goal line for the winning score. 1976 was another successful season for the Kilmer-led Redskins, as they reached the playoffs once again before falling to Minnesota. Kilmer showed once again the toughness which made him one of the most admired players of his era. Late in the 4th quarter of the home opener against the Giants, Kilmer was caught in a vicious hit between two Giant defenders, opening up a gash on his nose that would require 5 stitches to close after the game. Kilmer, covered in blood, returned a series later, throwing the winning touchdown to Mike Thomas with 45 seconds left in the game. Injuries and the budding talent of Joe Theismann resulted in Kilmer splitting much of the 1976-1977 seasons with the up-and-coming and more youthful and mobile quarterback. In 1977, the Redskins failed to make the playoffs, were swept by the Dallas Cowboys, and said goodbye to the legendary George Allen after his seven year contract expired, bringing in Jack Pardee to replace him. Kilmer flirted with the idea of following Allen to the Rams in 1978, but ultimately stuck around and backed up Joe Theismann for the rest of that season. It was clear that �Whiskey,� as Kilmer�s teammates affectionately referred to him, was in the twilight of his career, and that the Redskin�s future was now Joe Theismann. The 39-year-old Kilmer ended his 16 year career (cut by Jack Pardee and Bobby Beathard before the 1979 season) having completed 53.1% of his passes, for 12,352 yards and 103 touchdowns, for a 76.4% quarterback rating during his tenure with the Redskins. The last pass Kilmer ever threw was a fitting summary of his career, a wobbling, floating duck of a touchdown pass against the Chicago Bears. Over the years, Kilmer has been portrayed as a beer-bellied overachiever�an athlete who triumphed in spite of his skills, not because of them. Although he did sport a �gut� towards the end of his playing days, this caricature belies the talent, drive, and leadership Kilmer displayed throughout his career. Billy Kilmer was a gifted athlete, one George Allen called, �the most underrated player I ever coached.� His record as a starting quarterback with the Redskins was 51-18. Until Michael Vick broke it in 2004, Kilmer held the NFL record with the most 100 yard rushing games by a quarterback (4 total, including 3 straight games in 1961). Following his retirement, he contemplated coaching (he had been offered the Tulane football coaching position in 1976), but opted to take a break from football. In 1981, he served briefly as the commissioner of a new national Spring football league, the American Football Association (AFA) before the league folded after its first year. In 1984, Billy Kilmer was inducted into the UCLA Athletics Hall of Fame. On August 12, 2000, he was inducted into the College Football Hall of Fame. In November 2002, Kilmer was named one of the Washington Redskin�s 70 Greatest Redskins. He resides today in Florida with his family. He and Sonny Jurgensen are still the best of friends and talk often. Last edited by Boone; 07-01-09 at 12:06 PM. what an avalanche of memories. still laughing after reading the quote, "Where can a guy get a beer around here?" Great article, thanks tar uh Boone. Figured since, back then, one of those took me a week to write, I oughta at least recycle Good news is, now we've got the REAL Redskins Historian with us, and he puts anything I've done to shame. Awesome read....I love it...can't wait to read the others! Great read. I'll admit to having the "I Love Sonny" sticker but grew to love Billy as well. The only thing missing is the story of Sonny and Billy drunk and throwing $100 bills around the Toddle House. I don't recall any of the details of that incident but I'm sure it would make a great story.